The Outer Hebrides, or Western Isles, sit a mere 28mi (45km) off the NW tip of Scotland and receive the brunt of the Atlantic’s force through a helpful 180 degree swell window. The short continental shelf adds to the power of the waves and strong currents are the norm. A good range of beaches, points and reefs are surfed by the small, committed and knowledgable group of local surfers who get to surf until midnight on midsummer days. To the west of the mainland lies the fractured archipelago of the Hebrides. The area has so many islands, islets and coastline that even the environmental authorities can't really monitor it, so the potential for virgin waves is high. The Outer Hebrides receive the brunt of the Atlantic's force and have a helpful 180¼ swell window from the SW to NE. A good range of beaches, points and reefs exist and the small, committed group of local surfers are welcoming to visitors that play by the rules. Strong currents are the norm and local knowledge can prevent the unwary getting into trouble. 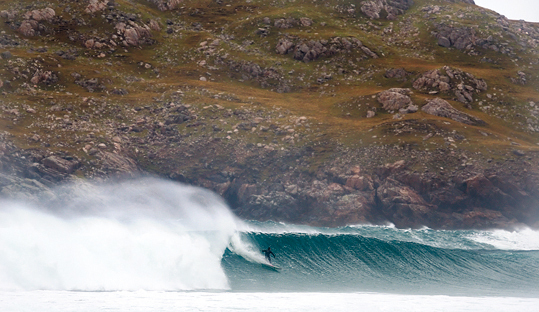 The Hebs are a year-round destination but it can get real big and nasty in the winter. The swell window extends from SSW around to NE swells arriving from the Norwegian Sea. When west-facing Lewis spots become out of control, the normally flat north or even east-facing spots start breaking and provide good shelter from the dominant and blustery SW-W winds. Spring into summer sees more E quadrant and slightly less W, but speeds remain F4 or higher. The “Hebs” are a year-round destination, but it can get real big and nasty in the winter. Large 5.5m tidal range affects the points and the beaches in smaller swells. The Gulf Stream ocean current moderates the climate and despite the northerly latitude, winters are rarely cold on the coast and summers rarely warm. Despite being 800mi (1300km) north of London, the mean minimum temps are about the same. January is the windiest month, May is the driest and December the wettest. The famous Scottish “4 seasons in a day” weather is very changeable. In midsummer, there are barely 2 hours of darkness. August sea temps can top out at 14°C (58ºF) and in March can dip below 7°C (45ºF). Booties needed most of the time. Watch whales, orcas and Risso dolphins, which are most sociable from Aug-Oct. Numerous lochs to fish salmon or trout. Great for diving, canoeing, sailing, mountain biking, climbing or coasteering. Don’t miss the 5,000 yr old standing Stones of Calanais or The Broch at Carloway, a mere 2000 years old. Autumn Aurora Borealis can be seen. Powerful waves, rips, winds, rocks and isolation can increase the fear factor. No dangerous animals. Stay warm and dry - bring appropriate clothing. Derek Macleod’s Hebridean Surf shop at The Welcome In Filling Station in Lower Barvas sells and rents essential equipment with full surf school. Surf Lewis do lessons, board and SUP rental. Sunday is rest day, no transport. All place names and direction signs are in Gaelic.